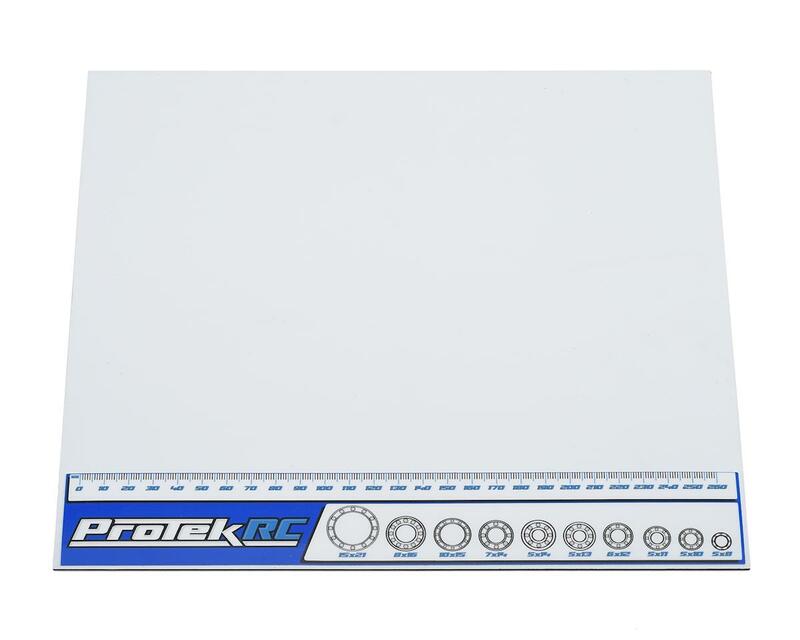 The ProTek RC 10x11" Magnetic Pit Mat is a handy accessory that every RC enthusiast can use. A magnetic work mat is a great addition to your work space because they help prevent parts from rolling off your bench and disappearing into the abyss of your garage floor. While a large mat is a great accessory for your home shop, they can be challenging to take with you without risking damage to the mat. Plus, due to space restrictions, your "home away from home" work bench may not be well suited to a large mat. So we collaborated with Cow RC to develop a magnetic mat that is easy to pack, easy to haul and useful for every RC discipline. The convenient 10" tall, 11" wide size makes the ProTek Magnetic Mat easy to stash away in a variety of spaces. The pre applied decal features a 0-260mm scale that can be used to measure screw lengths, turnbuckles, links, wire lengths and more! Plus, we added bearing profiles to the decal to help identify common bearing sizes from 5x8 to 15x21. The white vinyl surface makes small parts easy to see, is stain resistant, and is easy to clean with soap and water. As an added bonus - the mat fits perfectly inside the instruction manual/setup sheet pocket on the right side of the ProTek P-8 Hauler Bag (PTK-8000). 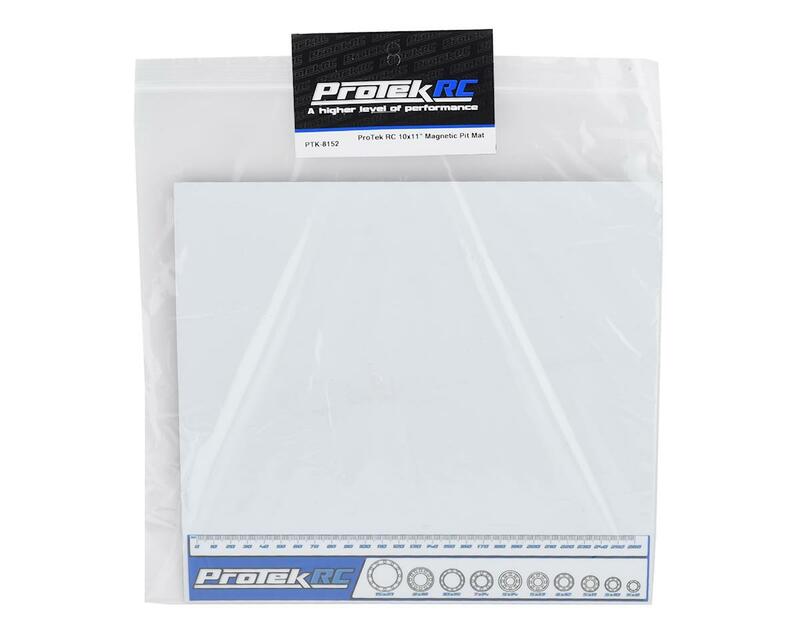 So if you are serious about wrenching and have been looking for a multi-use product to help optimize your work space, the ProTek 10x11" Magnetic Pit Mat is an affordable solution that every hobbiest can fit into their routine. If the mat cannot be stored flat, store it in between two flat rigid surfaces to prevent warping. Do not roll, fold or crease as this may cause irreversible damage. To prevent staining, wipe the mat down after every use, and when needed wash with soap and water. A vinyl safe cleaner can be used for stubborn stains. Metal filings, carbon fiber dust or mineral heavy dirt can damage the vinyl surface. Use a damp rag, and soft dabs to pick up contaminants without sweeping the material as this may scratch the vinyl. Metal shavings can be removed with masking tape, using light dabs to adhere the metal to the tape. Loctite and thread lock will stain the vinyl. Clean immediately with a vinyl safe cleaner to avoid staining. Tires, especially tires with traction additive applied may stain the surface. Clean the surface with a vinyl safe cleaner immediately to help prevent staining. Hobby knives and razor blades will cut the mat. Avoid exposure to heat, such as long term direct sunlight, a heat gun or soldering irons as extreme heat will cause the vinyl surface to bubble.